There are so many features that you can add to your homes these days. Take a look at my personal favorite - mudbenches! 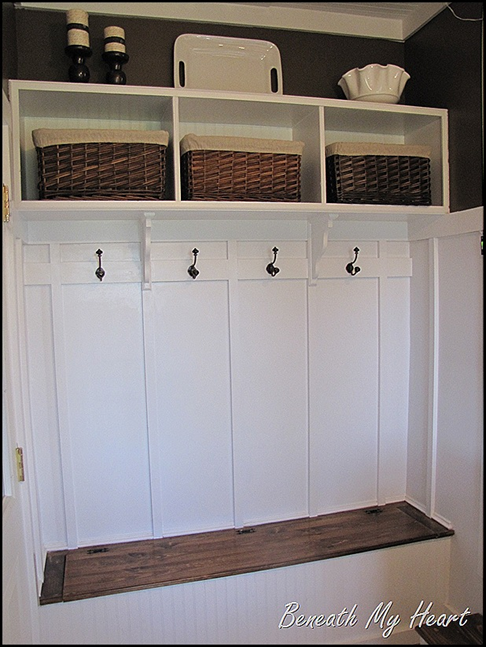 Some people opt for an entire mudroom in their home, but if you don't have that much space, a great alternative is a mudbench. They're usually placed in your entry way or in a nook close to the door. These little gems are great for families or homes with roommates. You can store all of your items that you need when you go out - hats, coats, backpacks, keys, shoes, etc. 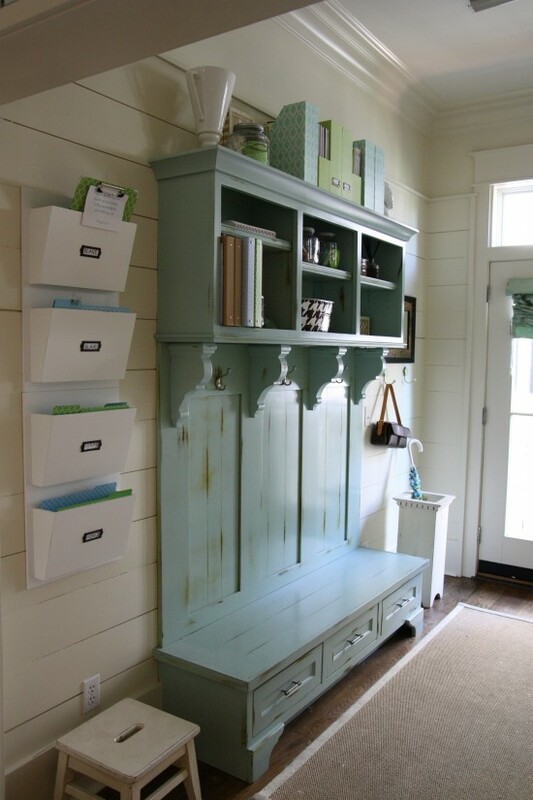 Some even have mirrors for last looks before running out the door, or cork-boards to remember events or grocery lists. Running a household is never easy, and keeping it clean is even harder. That's why I love the ease of mudbenches - it's the first thing you see when you come home, and the last you see when you leave. So everything is in one place, and stored neatly out of the way. You can customize mudbenches to meet the style and needs of your home. So add a charging station for your phones, laptops and tablets, put a dog/cat bed underneath for your pets to play, or paint it with each person's name on their space. These are just a few of the mudbench designs created by Woodmaster Woodworks that I love. Feel free to check out more on our website, facebook, houzz & pinterest profiles. Or contact us for a FREE in-home estimate 919-554-3707! What is this Beautiful Room II? For those following Woodmaster Woodworks previous blog post, you are aware that I am following up a small series on decoding interior trim architectural terms that break down a beautiful room. On this post, I have taken another beautiful room with different options than the original post to illustrate more alternatives to incorporate into your home. French doors typically refer to a pair of doors but can be single. They are a light weight construction door that is primarily composed of glass. The pair in this beautiful room is called a 15 light, referring to the number of panes or glass boxes in the door. These French doors are also adorned with casing trim as previously described on the original post. Coming off the doors, are another style of beautiful wall panel design that again was described in more detail in the previous post. An arch is a structure that forms an entrance opening in a curved, pointed, or square shaped design. Not only does it provide structure for support above it, arches offer a timeless classic beauty. Like all other divisions of interior trim, arches offer many different sizes, styles, and adornments in addition to the shape options. The beautiful room picture above shows a traditional style small curved arch with casing. Other examples of arches and additional trim options are pictured below. The first and second arches are large arches adorned in different trim details but both beautiful. The last arch has recessed panels inlaid into the arch for even more added beauty. The last and most stunning part of this beautiful room (in my opinion) is the coffered ceiling. A coffered ceiling is a ceiling that has a recessed panel appearance in multiple box shapes. They are typically square, rectangle, or octagon. They differ greatly in appearance from a tray ceiling that was briefly touched upon in the last blog, which is an inverted appearing ceiling with a solid, universal design rather than the coffered multiple box design. All of the pictures above are custom ceilings done by Woodmaster Woodworks showing various options for coffered and tray ceilings. The first 3 pictures are coffered ceilings and the last two are tray style ceilings. The first picture illustrates a multiple shape and size coffered design with two tone paint to add depth to your ceiling. The second coffered ceiling shows elaborate trim detail encompassed into a single paint color ceiling. The last coffered ceiling pictured is a flat style design in two tone paint to highlight the ceiling design. Both Tray style ceilings shown are the more layered style. The first picture having a decorative trim inlaid within the inner border of the recess and the second has multiple layers offset with two tone paint colors to add more depth and a paint wall match. Which ever style of custom ceiling and options you prefer to incorporate into your beautiful room, the end result is absolutely gorgeous! I hope both Beautiful Room blogs have helped to clarify some terminology but most importantly give you inspiration for your home. Regardless of which options appeal to you from both blogs, all are beyond stunning and truly sets any room of your home apart from any other. We welcome all comments here and our Facebook page on this blog or any inspired home ideas you would like to see on an upcoming blog. Thank you for continuing to follow us and our blogs. If you are in our area and interested in a free in home estimate, visit our website at www.woodmasterwoodworks.com to schedule a quote or see more amazing photos of work done by Woodmaster Woodworks!